Explanation: What kind of celestial object is this? A relatively normal galaxy -- but seen from its edge. Many disk galaxies are actually just as thin as NGC 5866, pictured here, but are not seen edge-on from our vantage point. A perhaps more familiar galaxy seen edge-on is our own Milky Way Galaxy. Cataloged as M102 and NGC 5866, the Spindle galaxy has numerous and complex dust lanes appearing dark and red, while many of the bright stars in the disk give it a more blue underlying hue. The blue disk of young stars can be seen extending past the dust in the extremely thin galactic plane. There is evidence that the Spindle galaxy has cannibalized smaller galaxies over the past billion years or so, including multiple streams of faint stars, dark dust that extends away from the main galactic plane, and a surrounding group of galaxies (not shown). In general, many disk galaxies become thin because the gas that forms them collides with itself as it rotates about the gravitational center. The Spindle galaxy lies about 50 million light years distant toward the constellation of the Dragon (Draco). NGC 5866 by Adam Block. Adam Block's picture of NGC 5866 is stunningly good. To appreciate just how great it is, let's compare it with the Hubble Telescope image of the same galaxy. As you can see, Adam Block's image reveals stellar streams in the halo of NGC 5866 that are quite invisible in the Hubble image. This is not the first time that amateurs reveal details in galaxies that had not previously been spotted by professional astronomers and telescopes. 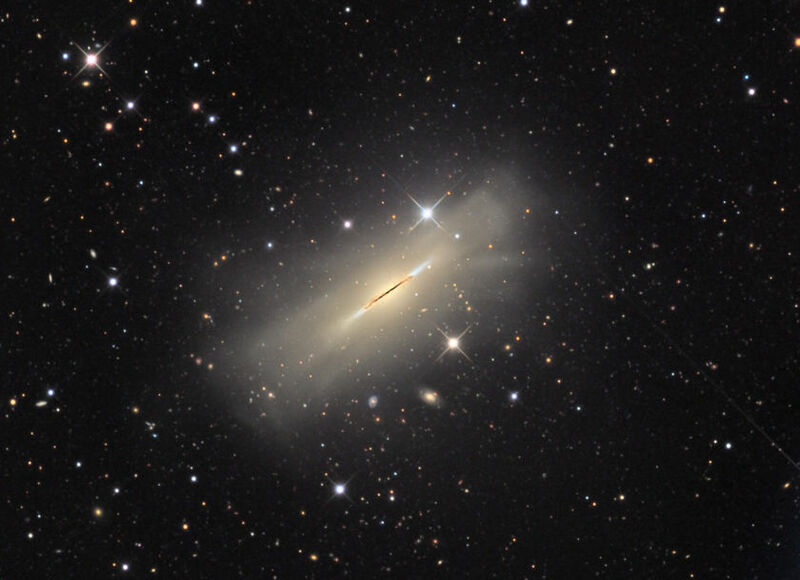 The caption of today's APOD said that NGC 5866 is a very thin galaxy, but I disagree. It is relatively puffed up. Its central dust lane, however, is extremely thin and quite short. In disk galaxies, I'd say that this is a sure sign that the dust lane is shrinking and that star formation is in the process of shutting down, if it has not done so already. The bluish disk extending beyond the short, thin central dust lane is not very blue, and we see no signs of young star clusters in the disk. In fact, we see no clear signs of young clusters anywhere in NGC 5866. The bluish stars in the disk of NGC 5866 are probably modest A- and F-type stars, not blisteringly hot young O- and B-type stars. Note that the overall color of NGC 5866 in Adam Block's image is slightly yellow, whereas the color of the galaxy in the Hubble picture is almost bluish. I like the color in Adam block's picture better, because NGC 5866 is slightly yellow compared with the color of the Sun. In Hubble pictures, I believe that the overall color of galaxies like NGC 5866 are defined as "white", and only details in the galaxy and in the background are shown as non-white (in contrast to the presumed overall whiteness of the galaxy). Adam Block's image is superb! What a beautiful photo! Right now there is intense interest in what they call the "circumgalactic medium" which is low density and very hot. There is certainly an extended glow of some kind around THIS galaxy. Anyone know what it is due to? I don't. The extended glow is probably due to the mergers of dwarf galaxies with NGC 5866, which have left stellar streams behind. The buffeting of impacts on NGC 5866 has probably just generally made the galaxy "puff up". Not usually a fan of recignising shapes ("paraloiea"?) the Spinning Coin is excellent. The residual star fields around 5866 describe a very distinct cylinder, just as a coin does, thicker than it is as it winds down to stillness. Is our Milky Way as distinct? Stars? Outside of the gas that is very close to hot stars, not much hot, low density material radiates enough in the visible spectrum to show up in images. Thin, hot gas is usually detected in UV or x-ray emissions.
" In Hubble pictures, I believe that the overall color of galaxies like NGC 5866 are defined as "white", and only details in the galaxy and in the background are shown as non-white (in contrast to the presumed overall whiteness of the galaxy)." Although the assignment of color in astronomical images is somewhat arbitrary and takes advantage of 'artistic license' I think you'll find that most scientists consider the majority of galaxies to be reddish or bluish. What are considered to be 'white' galaxies are Hubble classifications Sa, Sb, Sc, Scd, SBa, SBb, SBc or SBcd. I believe NGC 5866 is an S0 type. This is certainly the deepest image of NGC 5866 I've seen.